Choose the correct answer in Questions 1-3. (c) A group of stars that appear to form a pattern in the sky is known as a __________. (c) A group of stars that appear to form a pattern in the sky is known as Constellation. 5. Mark the following statements as true (T) or false (F). Venus appears in the western horizon.It becomes visible after sunset and that is why called as evening star. Jupiter is the largest planet of solar system. A constellation is defined as group of stars that form an imaginary recognisable pattern. To locate pole star in the sky, first of all Ursa major has to be located.Consider two stars at the end of the bowl. Draw an imaginary straight line towards the northern direction.Connecting these two stars.This imaginary line will meet at Pole star.The length of the imaginary line will be about five times the distance between the two stars of bowl. The earth rotates from west to east on its axis.All stars in the sky appears to move from east to west.But the pole star does not appear to move in the sky because it is located above the axis of rotation of earth. understand by the statement that a star is eight light years away from the Earth? The distance between stars and earth is million of kilometers. Thus these large distances are expressed in light year.One light year is equal to 9.46 ×1012 Km. It is the distance travelled by light in one year.A star is 8 light years away from earth means that the distance between the star and earth is equivalent to distance travelled by light in eight years i.e. a star is located 8 × ( 9.46 ×1012) = 7.6 × 1013km away from the earth. 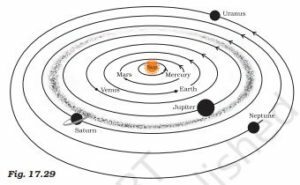 The radius of Jupiter is 11 times the radius of earth. So Jupiter can accomodate 1331 Earth. sketch correct? If not, correct it. Boojho’s sketch of the solar system is not correct because he has interchanged the position of Mars and Venus and also the position of Uranus and Neptune.